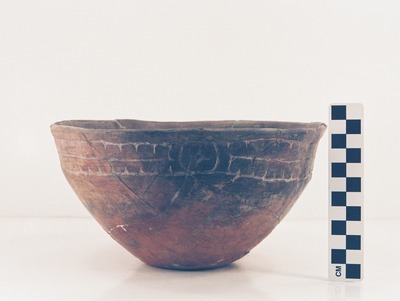 "41MR12, Burial III, 74" by Timothy K. Perttula and Robert Z. Selden Jr.
DECORATION: The engraved design on the vessel rim is the pendant triangle motif (Thurmond 1990: Figure 6a). This motif is comprised of two alternating diamonds and buttons as the central elements as well as rows of small pendant triangles above and below the central engraved elements. A white kaolin clay pigment has been rubbed in the engraved lines.